A deadly superbug and an advanced lightning sensor will be among the varied cargo heading to the International Space Station as SpaceX launches its 10th commercial resupply mission for NASA. 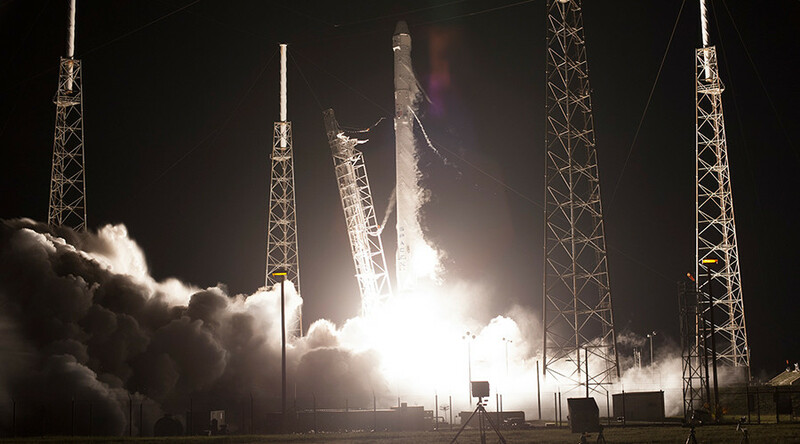 The SpaceX Dragon spacecraft will lift off from the company's Falcon 9 rocket from Kennedy Space Center's Launch Pad 39A on February 18. The mission will carry a number of science projects aimed at exploring the medical, psychological and biomedical challenges astronauts face during long-duration spaceflight. One NASA-funded experiment that sounds like a plot straight out of a horror movie will see a batch of the MRSA superbug sent to the ISS. MRSA is a potentially deadly strain of bacteria, commonly found in hospitals, but NASA says it will pose no threat as it will be sealed within three levels of containment. Dr Anita Goel, who is leading the study, told Space.com that the team hopes the experiment will lead to a greater understanding of how MRSA, notorious for its antibiotic resistance, mutates. "Microgravity may accelerate the rate of bacterial mutations. If we can predict future mutations before they happen, we can build better drugs," she said. Another experiment will use the microgravity environment to grow stem cells that are of sufficient quality and quantity to use in the treatment of patients who have suffered a stroke. Meanwhile an investigation led by Merck Research Labs will test growth in the microgravity of antibodies that are important for fighting a variety of human diseases, including cancer. Two earth science payloads – the Lightning Imaging Sensor (LIS) and the Stratospheric Aerosol and Gas Experiment III (SAGE III) - will be carried in the Dragon’s trunk and externally positioned on the station. The Lightning Imaging Sensor will help scientists better understand lightning by taking measurements 24 hours a day. The sensor will record several measurements including the number of strikes, and the frequency and energy output of each strike. SAGE III will measure the Earth’s ozone along with other gases in the atmosphere by locking its view on the sun or the moon. ISS Astronauts will use the station’s robotic arm to capture Dragon when it arrives at the space station after its two-day journey. Crew members will unload the spacecraft for about a month before reloading it with cargo to return to Earth.